Jay earned his BA in the Arts from Montclair State University. He is a New Jersey native and currently resides between New York City and Philadelphia in the Beach Town of Belmar, NJ. Jay has shown his work in galleries in New York City, California, New Jersey and in National and International Publications. When not creating art, Jay spends time with family, friends and with many of his life's passions. 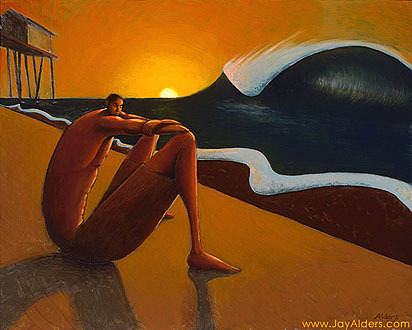 Jay enjoys activities such as surfing, skateboarding, snowboarding, playing guitar, kayaking, scuba diving, meditating, reading, dancing, writing and traveling. I'm often asked what a painting "means" or what was my inspiration. People always want an easy answer to everything. If I paint an image, it was inspired by things in nature that I observed and rearranged through my own thought process. I may have created a new paradigm but not the subject matter itself. I prefer people become a "co-creator" of my art and find their own inspiration in it. Sometimes, when I paint, I just see the image and almost trace it as if my brain were projecting it on the canvas. Sometimes, I have no clue what's going to happen next and it's just exciting to watch something happen while I humble myself with learning and screwing up. Other times I zone out hypnotically and it's the most relaxing activity I can participate in. However, it's not always the process of painting itself that's the most rewarding, it's being able to bring to life and share with others the weird things that float around my head. When I shoot photos I am both trying to create great photographs as well as inspiration and reference for my artwork. I think they influence each other. When I am retouching or creating a photograph with a model, I am thinking in "Painting" half the time. Likewise when I am creating artwork, no matter how warped or surreal it is, I will pretend it's photographic to achieve the desired angle, color or reality. I think this sort of thinking allows me to create a unique look.